A warlord who leads the King of Fist's army to the Valley of the Black King, where they ended up being trampled to death a herd of wild horses. After Raoh tames the Black King and his herd, Gion surrenders and becomes a sycophantic servant to the King of Fist. 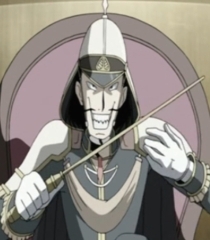 He is initially assigned as the Warden of Cassandra, but is demoted to assistant warden after Uighur takes his place.